New commissions by Ahmet Öğüt, Natascha Sadr Haghighian, Dan Perjovschi, Martha Rosler, Superflex and Krzysztof Wodiczko. Martha Rosler, Coin Vortex for Student Debt, 2014, photo courtesy Aaron Word. 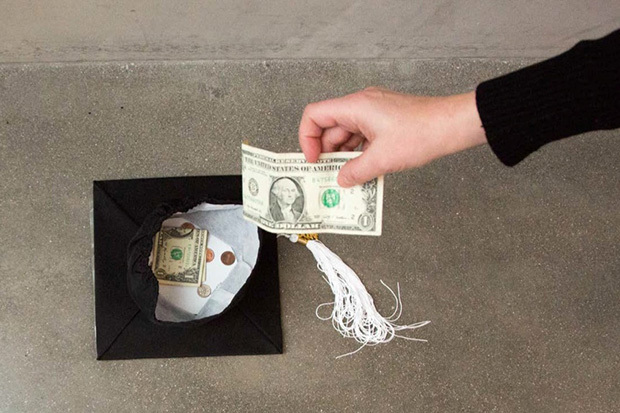 Superflex, Academic Square Cap upside down, 2014, photo courtesy Aaron Word. 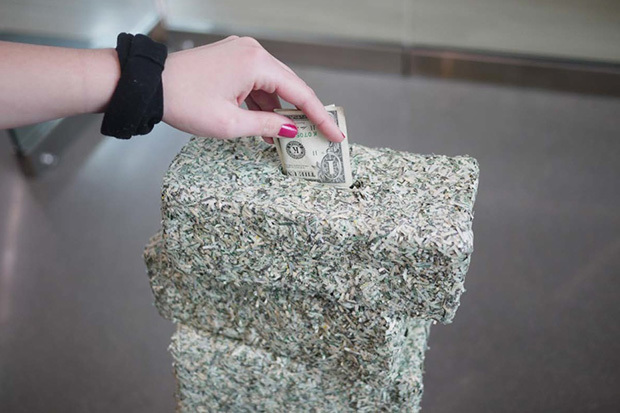 Natascha Sadr Haghighian, Donation Tower (former value $10,000), 2014, photo courtesy Aaron Word. Dan Perjovschi, Bag It!, 2014, photo courtesy Ahmet Öğüt. East Lansing, MI - The Eli and Edythe Broad Art Museum at Michigan State University and the Istanbul-based art organization Protocinema present "Day After Debt," a collaborative project initiated by Kurdish artist Ahmet Öğüt that examines student debt in higher education in collaboration with Debt Collective. The exhibition, which will be installed in public spaces throughout the Broad MSU, runs from Nov. 23 through April 12, 2015, and includes new commissions by Ahmet Öğüt, Natascha Sadr Haghighian, Dan Perjovschi, Martha Rosler, Superflex and Krzysztof Wodiczko. "Day after Debt" is a masterful exhibition by internationally venerated artists that addresses a huge concern for students who, into adulthood, become straddled with enormous debt," museum founding director Michael Rush said. "The exhibition represents the Broad MSU's dedication to international art with a socially engaging message." 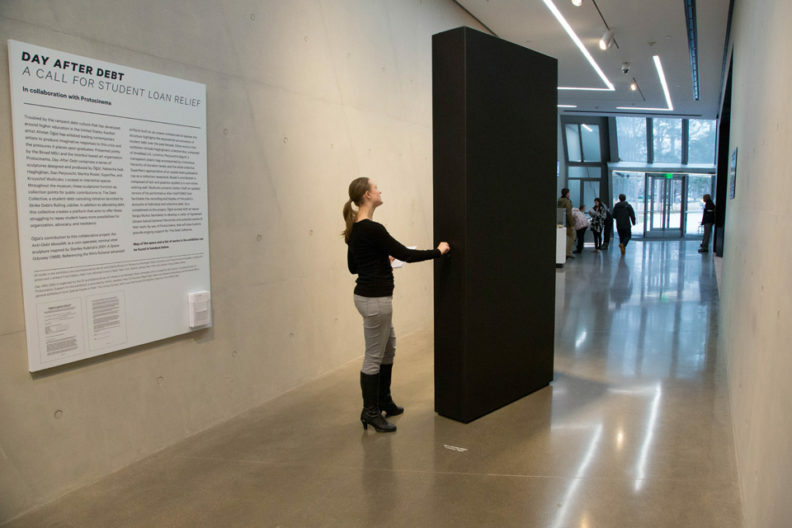 Öğüt's coin operated "Anti-Debt Monolith" is a steel minimal work referencing the fictional advanced artifacts of non-human origin built by an unseen extraterrestrial species that appear in Stanley Kubrick's "2001: A Space Odyssey" (1968). The work responds to coin donations with an audio recording of the growth of student debt in the past 10 years. 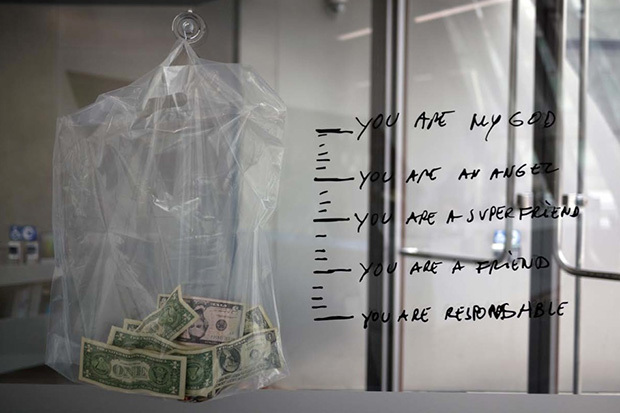 Other works in the exhibition include Haghighian's collection box composed of shredded U.S. currency and Perjovschi's "Bag It!," a transparent plastic bag accompanied by a humorous hierarchy of donation levels. 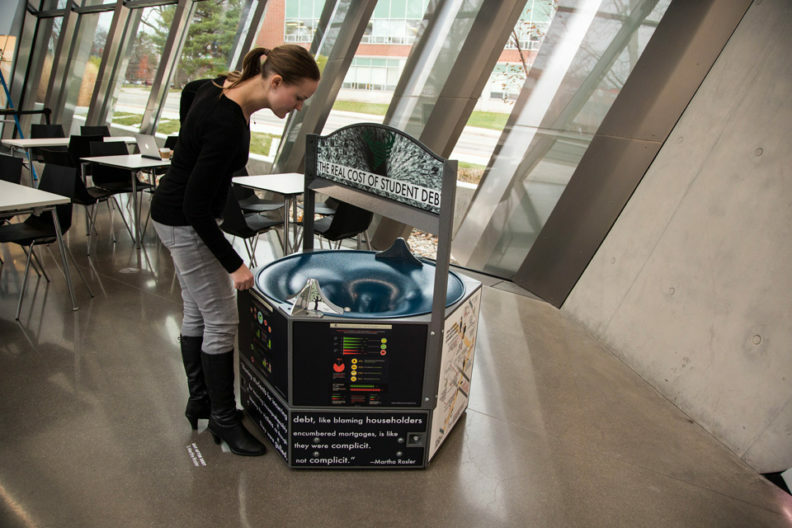 Superflex makes use of an upside down graduation cap as an "honor system" money collector, while Rosler's participation is comprised of text and graphics applied to a coin vortex wishing well. 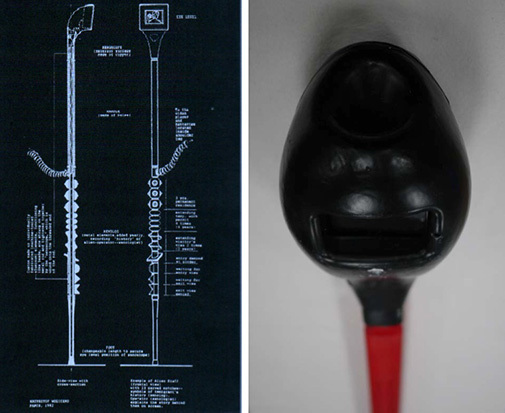 Wodiczko presents "Debtor Staff," a new version of his equipment for strangers and the estranged that is an evolution of its predecessor, the "Alien Staff" (1992). Taking advantage of new mini-projector technology, "Debtor Staff" facilitates the recording and display of the public's accounts of individual and collective debt. Monies collected from the sculptures will go to a new student loan relief fund called Debt Collective and organized by Strike Debt's Rolling Jubilee, a network of debtors who liberate debtors through mutual aid. As part of the project, Öğüt is worked with art lawyer Sergio Muñoz Sarmiento to develop a Letter of Agreement between the artists and potential future owners by way of Protocinema to raise funds for Debt Collective. All agreements are contingent upon money collected in "Day After Debt" being deposited into this student public loan relief fund and seek to raise awareness of education related debtors. Protocinema founder and director Mari Spirito notes that "the issue of student debt in the U.S. mirrors a larger worldwide debt culture that is exploiting individuals. Day After Debt collects public funds from the sculptures that will be donated to Debt Collective to make a direct impact for many Americans." All works in the exhibition are commissioned by the Eli and Edythe Broad Art Museum at Michigan State University and Protocinema, courtesy the artists and Lombard Freid Gallery, New York; Mitchell-Innes & Nash, New York; Galerie Lelong, New York; Johann König Gallery, Berlin. "Day After Debt" is organized by the Eli and Edythe Broad Art Museum at Michigan State University and is curated by Mari Spirito, founding director of Protocinema. Support for this exhibition is provided by SAHA, Istanbul, Haro Cumbusyan, Bilge Öğüt, Marty and Rebecca Eisenberg and the Broad MSU's general exhibitions fund. Special thanks to Pelin Tan, Koray Duman and Laura Hanna and Christopher Casuccio from Strike Debt. Eli and Edythe Broad Art Museum at Michigan State University The Eli and Edythe Broad Art Museum, a Zaha Hadid-designed contemporary art museum at Michigan State University, is dedicated to exploring global contemporary culture and ideas through art. Opened on Nov. 10, 2012, the dynamic 46,000-square-foot museum serves as both a teaching institution and a cultural hub for East Lansing and the region. In keeping with MSU's commitment to applying knowledge to benefit society and further the global common good, the Broad MSU's program of original and traveling exhibitions; initiatives with living artists; performances; and educational offerings for students, faculty, and the community make the museum a center for questioning and understanding the modern world. With a collection containing 7,500 objects from the Greek and Roman periods through the Renaissance and on to the Modern, the Broad MSU is uniquely able to contextualize the wide range of contemporary art practices within a firm historical context. The museum is named in honor of Eli and Edythe Broad, longtime supporters of the university who provided the lead gift of $28 million. For more information, visit www.broadmuseum.msu.edu.